Have you ever wondered what the kids actually do on their days in the garden? 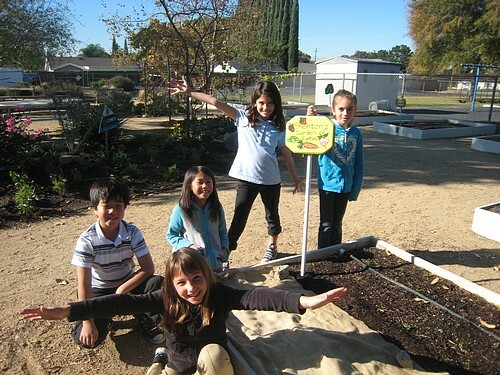 Here’s a glimpse at what Mrs. Shenton’s third-grade class experienced when they visited the TMA Garden, Dec. 1. The class was divided up into three groups: planters, maintainers and explorers. showing from last month’s garden day. The maintainers got to harvest bell peppers and squash pumpkins. Next, they learned how to properly harvest by using the garden tools to cut the bell pepper stems. The maintainers also worked hard cleaning the tables in the learning center area and raked up leaves, providing a well-manicured garden. The explorers became tour guides. They toured the garden and discussed the different areas, such as the butterfly and touch-and-smell areas, as well as the learning center. The explorers also talked about the different kinds of plants and trees in the garden. They discovered insects, such as worms and aphids. They learned about the word “recycle” and how we’re helping the environment by collecting rain water to water the garden and using chains attached to the roof to drizzle rain water into the flower beds. Maybe some time soon, you’ll be able to experience a day in the garden with your child and their classmates. Until then, check the blog weekly to get the latest garden news.